The Beyerdynamic iDX 200 iE offer wonderfully balanced sound and great build quality for the price. While its sound could be more spacious and its lack of Android support is disappointing, they offer a well-rounded package for their price. Competition in the sub-$200 in-ear headphone space is fierce, but Beyerdynamic's flagship iDX 200 iE may be one of the best. The iDX 200 iE sit at top of the company's in-ear headphone offerings, and after spending a week with them, I think they fully deserve the crown at the top. Beyerdynamic nails just about every aspect of what makes a great in-ear headphone, from its robust build quality, balanced sound, and excellent noise isolation. Although they don't offer active noise cancellation, these in-ears do a great job of blocking out noise whether you're commuting on a train or flying across the country. We loved the iDX 200 iE's predecessor, the Beyerdynamic iDX 160 iE, for its slick design and balanced sound. The iDX 200 iE are an improvement over the iDX 160 iE in just about every way, making them worth every penny of the $199 (€199, about £169 and AU$288) retail price. The Beyerdynamic iDX 200 iE feature an understated and somewhat generic design, with its "bullet" shaped buds. 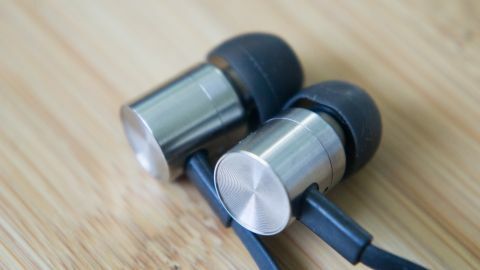 The earbud housings are made from a titanium alloy, which makes them super light and strong. Because of this, the substantial build quality of the iDX 200 iE should stand up to abuse. But, should anything go wrong, Beyerdynamic offers a two-year warranty just in case. The headphones feature a flat cable that resists tangles, although it can generate a bit of friction, especially when trying to use the included cable keeper. There's a microphone and remote control located on the right earbud wire which lets you take calls, change volume, and skip tracks if you have an iOS device. So what about Android users? Anyone using a phone with Google's OS are out of luck with the iDX 200 iE. Android users can still play/pause, select next track, and activate Google Now, but the volume controls won't work. The earphones come supplied with two different cables; one for Apple devices, and one for "devices incompatible to Apple." At first I thought it was for Android devices, but was quickly disappointed when I plugged in the cable and heard distant music. Beyerdynamic doesn't mention what devices would benefit from using this alternative cable but does mention that the headphone's volume controls won't work. Bummer. The included extension cables terminate in a 45-degree angle plug, which is a nice compromise. Some straight plugs stick too far out and some L-plugs are cumbersome. Included in the package are ten pairs of eartips to help you find the perfect fit. There's a mix of silicone tips and Comply foam tips for excellent isolation. The first thing that struck me about the Beyerdynamic iDX 200 iE is just how comfortable they are. The ear buds sit flush with the side of my ears, making them one of the few headphones you can actually wear to sleep, if you're into that kind of thing. I found the pre-installed medium sized ear tips to be a perfect fit for me, but it's nice that Beyerdynamic includes a ton of different tips to help you find the best fit. Once you do find a good seal, you'll be treated to a balanced sound signature that's just a touch warm. Mids and bass sound very good, as the iDX 200 iE can dig deep. There's quite a bit of impact for an in-ear headphone, but bassheads likely won't be satisfied. I would recommend the bassier sounding Sennheiser Momentum In-Ears or Razer Hammerhead V2 for lovers of the low-end instead. The only fault I could find with the iDX 200 iE's sound is its highs. There are some scenarios where the highs sound a bit piercing and bright, though there's still tons of resolution up top. If you're very sensitive to harsh high frequencies, however, I would pass on the iDX 200 iE for the Klipsch Reference X6i instead which offers a similarly balanced sound signature. I was impressed by the imaging of the Beyerdynamic iDX 200 iE, as it let me hear where each instrument was playing from within a room. The headphones don't produce as spacious of a sound as some over- or on-ear headphones, but it's pretty good for a pair of in-ear drivers. I played back music using my OnePlus 3 and it sounded great. The iDX 200 iE are very efficient at 35 ohms, so any device can drive them without the need for an amp. Just for kicks, though, I tried using them with my WooAudio 3 tube amp, which didn't improve the sound much. The Beyerdynamic iDX 200 iE are a worthy successor to the already excellent iDX 160 iE. They offer a great in-ear headphone package with its balanced sound, excellent build quality, and comfort. They're not cheap, but you get a lot for your money. No Android support is a bummer, but expected until Beyerdynamic releases an Android-compatible version. That said, frequencies in the high end can sound a bit harsh at times and its soundstage is quite narrow. There's no shortage of sub-$200 headphones on the market, but the Beyerdynamic iDX 200 iE are at the top of the pack. Their excellent build quality, sound and design make them one of the most well rounded in-ear headphones I've ever heard. No, they're not cheap, but you get what you pay for.